This isn't my design. I gave the manufacturer a very loose brief and asked them to come up with something. I have some ideas of my own but wanted to see what somebody else's idea of a modern pilot watch was. The date window wouldn't be that far inboard on a 40mm watch, I suspect the rendering is based on 42mm. does this mean you have settled on a 40mm case, and what other potential ideas do you have for this mk 4. Think a blank chapter ring might look better. I quite like the new 36 mm IWC pilot in terms of size. I think you can get away with smaller sized cases when they don't have massive bezels. Or indices only? I see no use for numerals unless the ring / bezel can rotate...and I don't think they are decorative. Looks great, didn't realise I needed to upgrade my SB3 until I saw that. black date wheel, green text, and i'd be very very tempted - especially with a ratcheting bracelet! Indices only would be better but I'm also thinking about alignment issues being eliminated if a blank one was used. Or maybe I've just had too many Seiko's! keep some numbers , maybe make some a bit bigger and protective shoulders for winding crown. Liking this style a lot the bits of colour look good adding a black date wheel and drilled lugs would be even better. nice, i like that. reservations about the date wheel/position aside. Real potential to do something distinctive and fresh here. For me, I think the abbreviated batons alongside the arabics need work. Circular lume plots instead? I'd be interested to see how full arabics looked, as well. Is a bigger date a possibility? I found the one on the SBIII somewhat difficult to read. And I'm afraid I don't like those hands. Good point, I think it is a watch that would benefit from having a 'big date'. Needs to be blue and yellow,42mm option of cyclops date,black date and bead blasted case and braeclett also like the large arabic numbers from oliver. I think the straight lugs would make it a different model, rather than a speedbird. Seems like the apple would be falling too far from the tree. Like it, a nice idea. Some points to perhaps consider, if I may. Current Speedbird date is nice and symmetrically positioned at 6. I would prefer that to 3, and as that has an index (no numeral), it should fit nicely too. I really like white hands on black (not silver, which can disappear in certain lights). Any chance of that? I like the red, but perhaps there is too much. Speedbird name to remain in white, perhaps? If the Speedbird 3 continues, I can see that Flieger hands extend the range. If this is a replacement, I would hate to see the MkXI hands abandoned. I love that the minute hand extends over the chapter ring, but in truth this is unlikely to happen, as the hands remain on the movement and the chapter ring in the case, so a clash is likely when assembling. The endlink to bracelet transition looks a little weird, with angled ends on the SELs and straight links on the bracelet, leaving a gap. Good point! Overlooked details like this can make a world of difference. have another play about with the MK XI design. I like the all the colored dial accents (not so much on the hands except the second hand), SB3 bracelet or at least a brushed bracelet instead of polished, black background date at 6 instead of 3, and A/R on only the underside. Lume on the numbers while I'm at it. Great launching point! 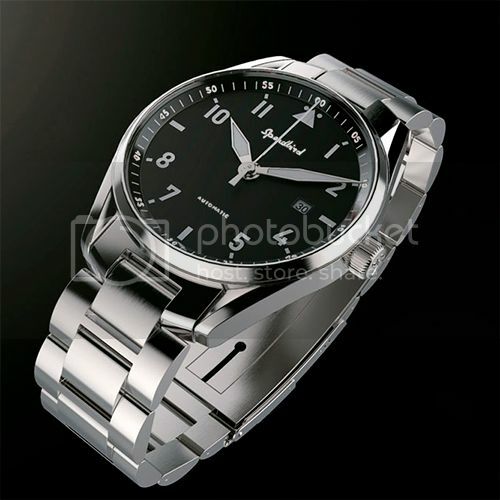 I reckon over 40mm it would be too big, because the dial already has quite some presence and tends to wear bigger. hell why not do a his & hers? so I can buy one too! For me, all text in white, tapered bracelet (down to 16mm) and an armoured plexiglass with tension ring. This would make the SB4 stunning timepiece! Lugs look too short on the mock-up, as they are on the SPIII, making wearing a Nato problematic. Ability to wear Nato is a must on these types of watches (for me anyway) - it's why I sold my otherwise near perfect SPIII. Like it. Definitely interested in seeing it with a black date wheel. 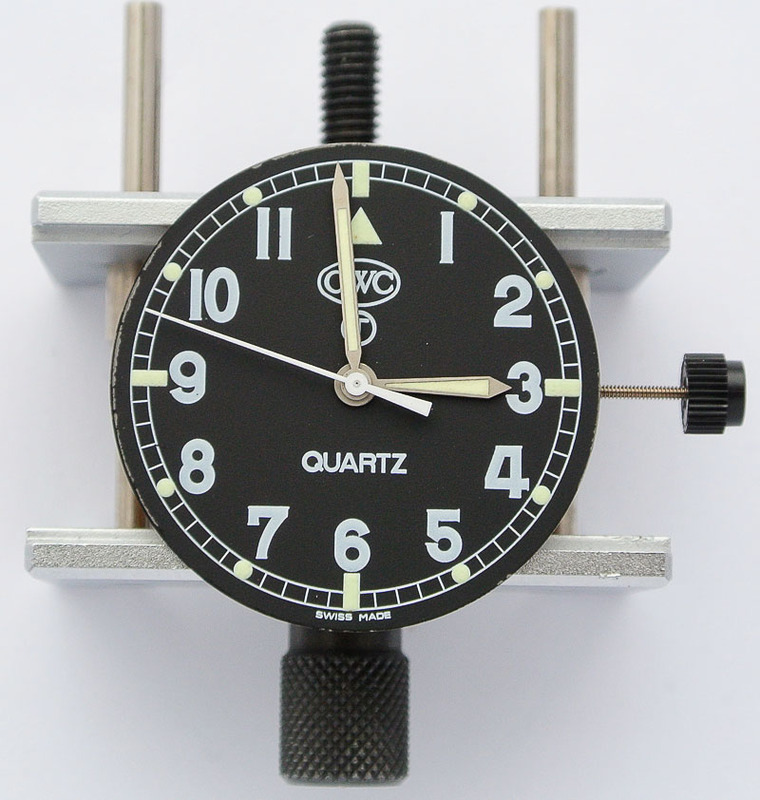 Very pleased to hear that you are thinking about the SB4; are you planning to produce a GMT version? The SB's have always "worn large" - I'm sure 40mm would be ample. Loads of lume - T100 TGLS perhaps? Will it come with stickers intact and no 6 month wait on the warranty card? Aside from no date, what am I missing? No date, no logo. Essentially the same as the first Speedbird except slightly larger, better lume and a bracelet. I'm not keen - the red doesn't appeal and I really dislike the hands. I much prefer the SB3, that is spot-on to me. It may well be the flat rendering but I'm sorry to say I can take or leave this. Whereas I covet almost every one of Eddie's other watches. 38mm case would be nice but it sounds like 40mm could be set by now? Own the SB3 which is just about perfect, would love to see the Prs1 reintroduced or something similar. SB IV would be a big seller with the sterile dial and that fantastic bracelet. One of the nicest bracelets there are. At least 42mm case (option?) for those of us who are on the bigger side. Date at 6. (Having the date a little inboard of 6 is better than inboard of 3.) Or no date. Batons at 3, 6, 9 should be longer, to occupy the same height as the numerals. The end links on that bracelet simply do not work. I'd be interested to see the render with red changed to white, and also with a sterile dial. Would a very slightly domed crystal be a possibility? Bezel, crown, lugs, hands, chapter ring, and numerals are all near perfect. Really like the overall design of the case and bracelet. End links are unusual, but I think I like them! Much more in keeping with the Speedbird lineage. I didn't find the original rendering spoke "Timefactors" or "Speedbird" to me in the least. The release of the MKII Hawkinge and the new IWC Mark XVIII "Nod to XI" show the demand for such clean retro designs. 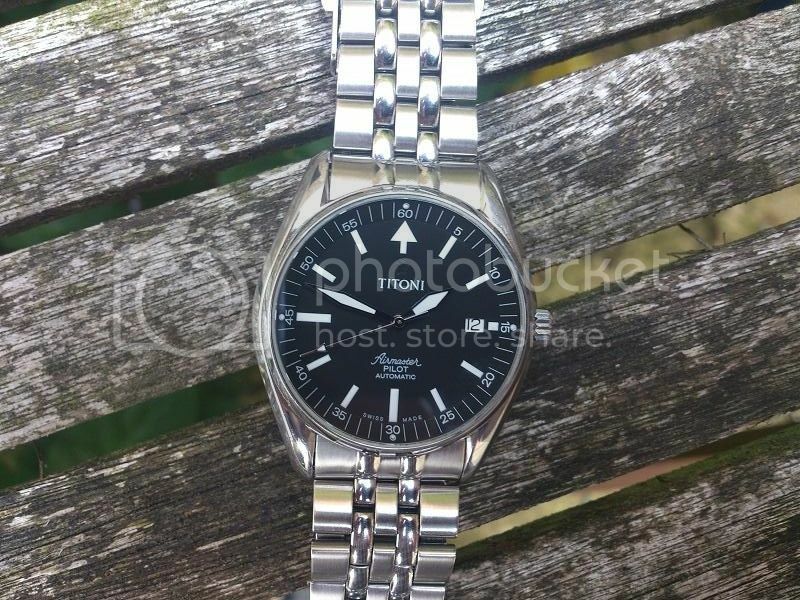 I'd like to keep the Speedbird text off the dial, but it could be fantastically engraved in script on the caseback. Last edited by redhed18; 18th August 2017 at 23:36. I agree with those saying to keep the old Speedbird hands. 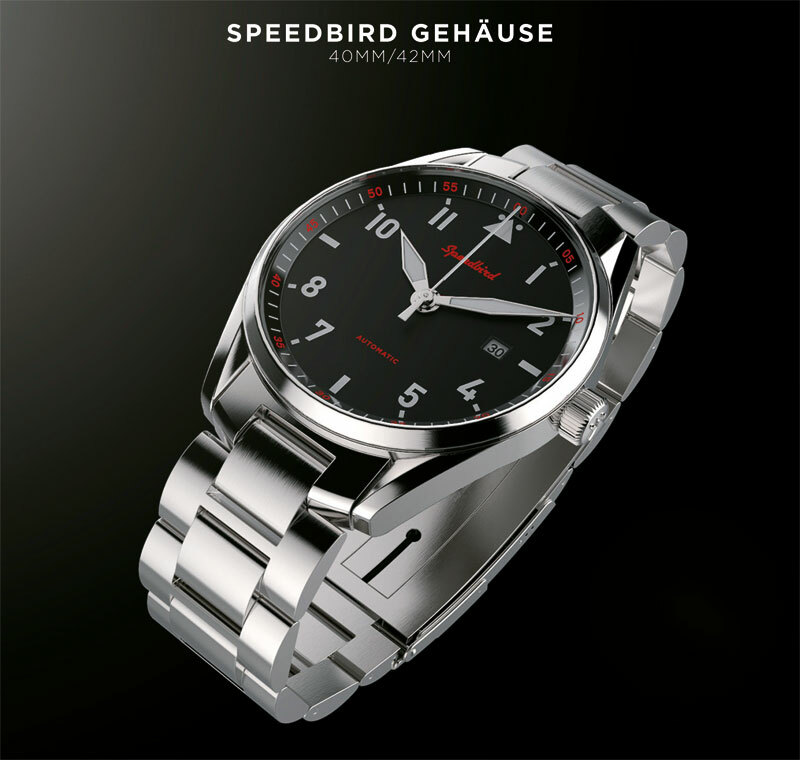 They are classic and are part of the charm of the Speedbird line. I also like the Speedbird script/ logo on the dial. I've had both versions of the Speedbird (sterile and with script) and I felt the one with the logo had more character. I wonder if there is a way to take the classic look of the Speedbird 3, keep some of the classic cues, but add some modern elements. Maybe sharpen the indices and numerals, use applied indices with lume fill, redesign the lugs as your did in the sample image. Basically somehow find a way to update the classic design and create a modern interpretation. I also prefer the classic bracelet. But if there is a way to taper the classic bracelet and add a RATCHETING CLASP that watch would be an INSTANT buy and my perfect watch. Thanks for the great work Eddie!